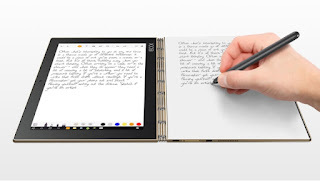 It has two panels that open up like an ultrathin notebook. It is just 9.6mm closed, tapering to 4.05mm at its slimmest edge and weighs just 690 grams. “The hinge is engineered to be smaller and features a custom-made three-axis hinge, with 130 different mechanical pieces comprising five different materials,” says Lenovo. It has four modes – Browse, Watch, Create and Type. The halo keyboard is a full touch-screen backlit keyboard that is made with glass for a rough, matte feel and finish, along with anti-glare coating for the best touch-typing experience. It constantly learns and adapts to the typing habits of its user, with built-in prediction and artificial learning software. It also has built-in, sensitive haptic technology. The real-pen accessory, a dual-use stylus that lets you write on a paper since it holds real ink tips or can be used as a stylus when applied straight onto the panel. You can take notes and annotate naturally, then save, edit, and even export them to other apps. It can draw with precision of a pencil or paintbrush, with 2,048 pressure levels and 100-degree angle detection. Backed by a 8500 mAh battery. Yoga Book with Android is available in Gold or Gunmetal and starts at 499 Euros (US$ 556 ), while the Yoga Book with Windows comes in Carbon Black and starts at 599 Euros (US$ 668. ).